weeklyOSM is proud to announce a version in one more language: Bahasa Indonesia. Thanks to Adityo, Harry, Ranie, and Wulan who joined our weeklyOSM Team. “10 years ago we used the Garmin eTrex to survey OpenStreetMap. Now it has built-in OSM mapping”. Today OSM is THE map on the new eTrex 20x and eTrex 30x. The Geoknow project has, with the participation of the University of Leipzig, published a JOSM plugin OSMRec. OSMRec suggests possible established alternatives when using a new tag. Is it possible to use WMS services in iD using something like WhooTS? TMS in iD should work, and there always JOSM of course (via OSM Help). What is the best way to tag an estate agent? That’s a question that Paweł Marynowski asked the tagging list. OSM2World developers Tordanik proposes the tag building:wall=yes in order to tag differently colored (and inclined) walls. There are currently very heated discussions about the license situation for a planned import of administrative boundaries in Nepal. This has been moved to “Legal” but yet not “arrived”. Soon will start the land use import in Slovenia. Impressive video of the earthquake in Nepal and HOT activities. Christian Quest has issued a similar map as MapBox for rescue forces in Nepal. Pierre Béland spread the news that he reads from the statistics by Pascal Neis: In the period from 25.04. to 16.05, in Nepal, there were more than 6500 active mappers. Landslide in Nepal – triggered by the earthquake on May 12. Where does the community map, before and after the first quake in Nepal? How has Nepal changed in OSM since 2012? (via Kangrex). Thanks to FOSM for the “before” tiles. 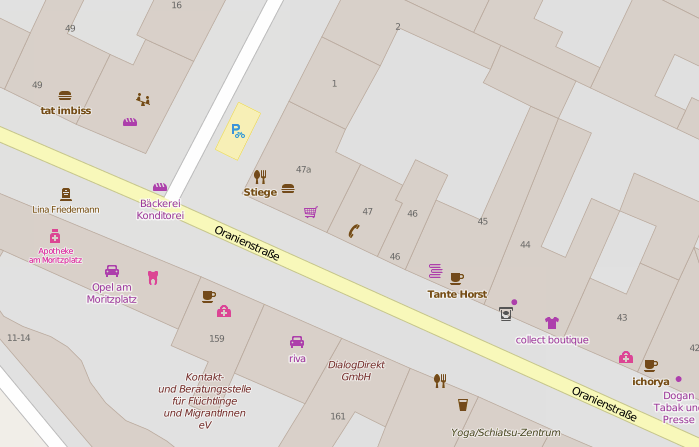 With the update to OSM Carto 2.30.0 benches, litter bins, bicycle stands and many other things have new icons. Mateusz Konieczny made some suggestions for rendering “surface” in the standard map. Pascal Neis has improved his OSM Changeset filter – useful for Mapathons or even school projects. Public transport in Panama City relies on OpenStreetMap. Pablo Cecconi says on talk-ar that the city of Buenos Aires has issued an OSM map. In addition to current construction sites, official cycle paths and public transport, you can find a variety of public institutions – labour offices, police stations, free Wi-Fi, healthcare, education and culture, and last but not least tourism and gastronomy. … the latest book about OSM? Apple has acquired high-precision GPS firm Coherent Navigation.